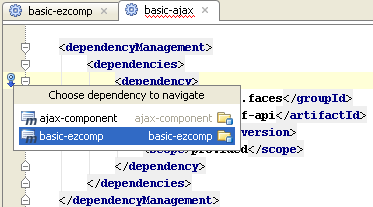 Since the latest IntelliJ IDEA 9.0.2 EAP the IDE contains a bit of new Maven-related pom.xml editor features. ‘Path reference’ notion were added to the editor to enhance the code completion, usages search and rename refactoring of project paths. IntelliJ IDEA analyses plugin parameter types and adds smart value editors for plugin configuration tags. You feedback is as always highly appreciated. This entry was posted in New Features and tagged Code Navigation, Maven. Bookmark the permalink. This is fantastic, even though I think Gradle is the future. Great news. Especially the parent handling is a missed feature. Gradle seems to make it right, although there are not as much plugins available as for Maven. @Peter: You can use the Grails Plugin in IDEA to write your Gradle scripts. Nevertheless, pom-editor is far from ideal. really cool. maven support gets better. Is there support for maven 3 in the newest community edition on Intellij? I use STS. In that for editing pom.xml, I am given a GUI option where we can search the dependency and add that directly to our pom.xml. Lesser xml editing stuff. IntelliJ is good but giving this kind of GUI for pom.xml editing will make more effective.